Forecastle Festival’s acclaimed Kentucky Bourbon Trail® outpost, The Forecastle Bourbon LodgeTM, has grown into a headliner all its own and will return in 2019 with a full lineup of Bourbon offerings from across the Commonwealth, unrivaled local Bourbon-inspired culinary experiences, new expert tasting experiences, exclusive access to rare sips and much more. 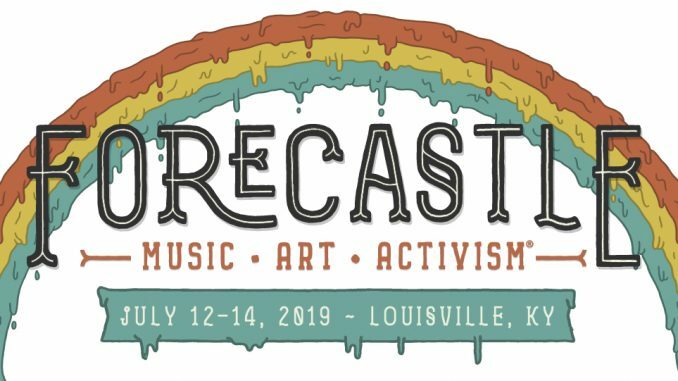 Embarking on its 17th year, Forecastle will return to Waterfront Park on July 12-14, 2019. The festival will feature a diverse collection of Kentucky Bourbon Trail brands, offering dozens of selections within the Forecastle Bourbon Lodge experience, including Blade & Bow, Bulleit, Four Roses, Larceny, Michter’s, Old Forester and Wilderness Trail. The full list of selections can be found at ForecastleFest.com. Now in its seventh year, the Forecastle Bourbon Lodge is a 16,000-square-foot oasis for festivalgoers, complete with an outdoor Bourbon garden and patio, air-conditioned lodge and full-service restrooms. Bourbon Lodge members and patrons can expect many returning favorites, as well as some special new surprises this year. For the first time, Bourbon Lodge members will have the opportunity to participate in up-close-and-personal Bourbon Tastings presented by The Bourbon Review led by industry experts, including Four Roses Master Distiller Brent Elliott, Heaven Hill Global Brand Ambassador Bernie Lubbers, Heaven Hill Master Distiller Conor O’Driscoll, Old Forester President Campbell Brown, Old Forester Master Taster Jackie Zykan, Wilderness Trail Bourbon Chief Jerod Smith, Wilderness Trail CSO & Co Founder Dr. Pat Heist, Wilderness Trail Master Distiller & Co Founder Shane Baker and more. The tasting demonstrations will be available daily, and a full schedule along with a list of offerings for each will be announced later. Members can participate using Bourbon Lodge tickets. Also new to 2019, Bourbon Lodge members can sip a special barrel-aged beer on the Bourbon Lodge patio at Sierra Nevada’s A Trip to the Woods specialty bar, offering limited edition selections from the series as well as other hard-to-find and experimental barrel-aged offerings from the iconic brewer. Returning in 2019, the Lodge will feature the Rarities Bar curated and presented by Justins’ House of Bourbon. The full rarities lineup showcasing one-of-a-kind, limited and vintage releases – many unavailable anywhere else – can be found below and at ForecastleFest.com. Those with Bourbon Lodge memberships will have early access to the release schedule for the weekend. Drink bourbon for a good cause. The Forecastle Foundation’s popular Bourbon Cares program supported by Liquor Barn returns to back a number of environmental conservation projects. Bourbon Cares will be pairing barrel selections from Four Roses, Old Forester, Wilderness Trail and Larceny with Forecastle Foundation partners to help raise awareness and funding. Also returning for 2019, the Flight Bar will provide patrons a rotating selection of Kentucky’s finest craft Bourbons, complete with curated, recommended flight pairings, and the chance to learn what makes each unique and special. The Mixology Bar will offer patrons the chance to have a professional local mixologist turn their favorite Bourbon into a hand-crafted cocktail. In addition, select Bourbon brands will offer signature cocktails at their booths. Crosley Radio® will join the Forecastle Bourbon Lodge for the second year with its Vinyl Rocket Jukebox, the only vinyl-playing jukebox being manufactured anywhere in the world keeping the music flowing all day long. Forecastle’s Great Lawn will play host to an artistic bar experience commemorating the legacy of Gonzo journalist and Kentucky Bourbon aficionado, Hunter S. Thompson. The Gonzo Bar presented by White Clay Consulting will offer a variety of Bourbons and specialty cocktails inspired by the iconic Louisville writer. New film and art components, inspired by Thompson, will be highlighted. Bourbon Lodge memberships are now available at ForecastleFest.com for $30 plus fees. Each Bourbon Lodge membership includes a commemorative Bourbon Lodge mug, allowing re-entry into the Lodge throughout the weekend, and 15 tickets worth $1 each to be used to purchase food and drink inside the Lodge. New to 2019, festival goers can redeem their Bourbon Lodge memberships and pick up a Forecastle Urban Bourbon Trail Passport, offering exclusive discounts and more, starting Thursday prior to the festival at the Louisville Visitor Center downtown. Bourbon Lodge Memberships will be increase to $35 during the festival, while supplies last, so act now! General Admission, Yacht Club and VIP weekend and daily passes are also available at ForecastleFest.com.